What role can innovation and technology play in intensifying production? How can we ensure developments in plantations are sustainable and accessible to all? And how can we bring it down to the local level, so the family farmer and the local community also benefit? These aren’t questions with easy answers. But the New Generation Plantations (NGP) platform is set up to confront difficult issues. On March 1-5 in Sao Paulo, these are among the issues that will be explored during the NGP 2016 Encounter,organised by WWF-Brazil, Fibria and Suzano. Participants from NGOs, private and public sectores, from Brazil and worldwide, are seeking answers to questions surrounding sustainable intensification. These include both the physical challenges of developing and deploying innovations in forest commodity production, and the socio-economic challenge of ensuring that technology reaches those who need it the most – particularly small-scale farmers and communities in developing countries. The NGP Encounter includes presentations, panel discussions and dynamic interactions, bringing a wide range of ideas and perspectives. The two-day event in Sao Paulo is followed by a day’s field visit to the Atlantic rainforest, where forest companies are working to protect and restore native forest alongside their plantations. The theme for this week’s meeting in Sao Paolo is “Sustainable Intensification”. For many people that phrase is an oxymoron or impossibility. How can something, particularly a forestry plantation, be intensified and be sustainable? It was an issue we explored on our first field trip to Fibria’s technology lab in Jacarei. Fibria is the world’s largest producer of pulp – a raw form of paper, halfway between wood and a finished product. Fibria produces 5.3 million tonnes of it every year, about half of which is used in tissue products. Fernando Berolucci of Fibria explained that one of their key indicators of success was how much land was required to produce a tonne of finished pulp product. In the last 30 years, they have reduced that area by half. This is really important when we consider that the global demand for forest products is still increasing significantly. How we can produce “more with less” is a crucial question not just for the pulp companies, but for everyone else, whether your interest is in agriculture or biodiversity. This reduction has been achieved through more efficient use of the raw material in the mill and better plantation management, but most significantly through tree breeding, to improve the qualities and growth rate of the eucalyptus trees used. It was fascinating to learn that we have only been scientifically breeding eucalyptus trees for about 30 years - just four generations of trees. In simple terms, we can trace the high-performing trees we have today back to their great-grandparents, but no further. In comparison, we have been selectively breeding corn since the 1890s, which itself followed centuries of agricultural improvement. That’s 106 generations of carefully documented selective breeding. 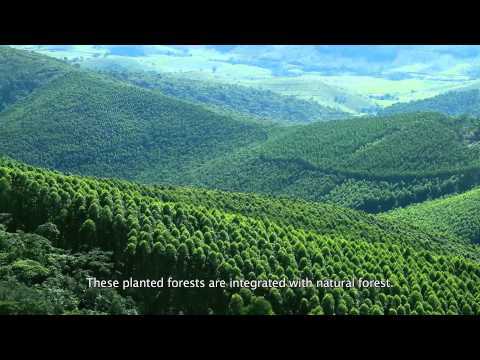 Fibria believe that with more research and understanding, they can improve their eucalyptus trees even further so that less land is required and it’s used more efficiently to meet the world’s growing demand for paper and tissue products. It’s exciting to think where we might be in terms of forestry production after 106 generations of selective breeding. Today’s highlight was a presentation from Dane Smith, a business consultant based in Washington DC. Dane is an expert in “creating shared value” and has worked with some of the NGP companies on this issue. Shared value is a business management strategy focused on companies creating measurable business value by identifying and addressing social and environmental problems that intersect with their business. There’s a clear difference between creating shared value and basic CSR (corporate social responsibility). The company isn’t solving the problem due to an obligation: instead, it’s turning the problem into an opportunity to add value to the business, while adding social or environmental value at the same time. Part of the challenge of this way of thinking is that a community and a company may not always realize that they have a common problem because they use a different language to describe the same thing. For example, a rural community might be concerned about the lack of higher education facilities and their young people moving away to go to college; a local company in the same area might have a problem with “talent attraction” and recruiting enough engineers to enable them to invest and expand their sawmill. A company with a traditional CSR strategy might give money to support local schools, and while this is welcome, it doesn’t add much value to the business. But if the company helps to design and run an engineering programme, and provides bursaries and work experience to promising local students, both the business and the community will benefit. To resolve the problem, the company needs to really understand the problem – and it can only do this by partnering with others who also experience the same problem. Collaborating with others to solve shared problems leads to innovation, and then scale, and then real impact. So the big question is, if there are opportunities out there to create business value, and to solve social and environmental problems, why aren’t lots of companies doing it ? Dane explained that this was often because companies aren’t used to collaborating with NGOs or communities in a meaningful way. In turn the NGOs and the communities are often suspicious about why the company wants to be involved. Perhaps this is the biggest difficulty – identifying the problem is one thing, finding a mechanism and an opportunity for companies, communities and NGOs to sit down together and to really listen, is often more difficult. Innovation is critical if we are going to solve the world’s environmental and social challenges, and innovation rarely happens without meaningful collaboration. Thursday is the main meeting at this year’s NGP Encounter. Well over 100 people had booked to attend, from a range of Brazilian and international NGOs to companies and academics. A key element of NGP is building dialogue and understanding: this always requires space and time, and doesn’t occur if people are just simply listening to presentations. This year Elena Dominguez of WWF-Spain suggested that we should do something different by building a Human Library. The Human Library is a worldwide movement for social change. It’s about generating conversations that can challenge stereotypes and prejudices. In a Human Library, real people are on loan to readers; at NGP we asked 11 people to be human books, and invited delegates to “borrow” them for a 20 minute one-to-one conversation. Each book wrote their own title, which you can see in the photo. The “books” were from five different continents, and a wide range of backgrounds. In most cases the reader and the book didn’t know each other before the event. We were initially very nervous, but quickly all of our books were out on loan, and stayed out for the full two hours. The common feedback was that that everyone enjoyed the simple pleasure of having a 20 minute uninterrupted conversation with another person. If we are ever to begin to solve the world’s environmental and social challenges, we need to work together. Without space and time for conversations, then will we ever begin to collaborate and to understand each other? What does the future hold? And how can we ensure developments in plantations are sustainable and accessible to all? Those were the questions we posed at the start of this week. How do we, or can we, get more from less? On Monday we heard from Fibria that the amount of land needed in Brazil to supply the average pulp mill (producing about a million tonnes of pulp) had declined from about 160,000 hectares in the early 1980s to about 80,000 hectares now. This has been achieved through research and technology, by the skills of plant breeders and plantation engineers, and through the use of fertilisers and pesticides. The current global demand for fibre and timber is about 3 billion cubic metres, which is met by an equal mix of plantations and natural forests. The long-term forecasts all predict that this demand will grow along with the world’s population. WWF’s Living Forests Report, for example, projects that demand could double or even triple by 2050. This growth isn’t evenly distributed in all parts of the world or in all types of production. New developments in timber technology and the need for low-carbon building materials are likely to mean a big increase in the use of wood in construction. Whilst paper use in Europe and North America is declining, it’s increasing significantly in Asia and Africa. So while we could undoubtedly do more to encourage wiser consumption patterns, global demand is still likely to grow as the world’s population increases and becomes more affluent. Plantations currently represent about 7% of the world’s forests by area; and by definition they are managed and harvested more intensively than natural or semi-natural forests. So if we are to meet the increasing demand for fibre and timber, should we simply increase the area of plantations? Could we manage existing areas more intensively? Or could we increase supply through a more extensive model, by managing larger areas of semi-natural forest? In reality I think the answer is we should try to do all three. But questions remain. Where and how? What tools should we use? How can we ensure that it’s done fairly? And that it doesn’t threaten food or water security, or contribute to biodiversity loss, or increase greenhouse-gas emissions? What is increasingly clear is that none of us have all the answers to these questions; and that even if we do find solutions to today’s problems, we’ll have new challenges tomorrow and the day after. Our best hope is to combine our knowledge, skills and tools, and build new, collaborative models. And it’s been encouraging to see during this week’s encounter that those collaborations are beginning to happen. At last year’s Paris climate conference the Brazilian government pledged to restore 12 million hectares of forest by 2030. This is a significant commitment when you think that Brazil has lost 60 million hectares of forest since 1970. It also puts into perspective the 3.5 million hectares of eucalyptus plantations in the country. Chatting to some of our Brazilian hosts, we learnt that much of this commitment will be delivered by enforcing the “Forest Code”. This requires landowners to restore a set percentage of native vegetation on their land. This includes many millions of hectares of cattle pasture that was cleared from the forest in the last 50 years. Much of the eucalyptus in Brazil has been planted on degraded cattle ranching land. In the Mata Atlantica (Atlantic rainforest) area we were visiting, landowners have to restore at least 20% of their land. Some are willing to do a deal with plantation companies – they will lease some of their land for eucalyptus plantations if the company also takes on the restoration commitment. As a result, large plantation companies like Fibria and Suzano have built up a lot of expertise in forest restoration. The venue for today’s visit was the 6,100 hectare Parque das Neblinas. The situation here is a little different. The native forest was cleared for charcoal in the 1950s and 1960s, then planted with eucalyptus. As we drove into Parque das Neblinas we were met with thick, lush tropical vegetation on steep slopes, with the dark greens and glossy leaves you would expect to see in the rainforest. However as our eyes adjusted and refocused, we could see the conspicuous straight, slender stems of eucalyptus trees towering over the other smaller trees and forming a strange-looking canopy of small leaves, which fluttered in the wind. Until 20 years ago, this area was managed solely as a eucalyptus plantation. When Suzano bought the area, they decide to set it aside for restoration. Perhaps because it had never been converted to cattle pasture, the area had retained more natural vegetation. It’s also an important buffer between the ever-expanding city of Sao Paulo, home to 20 million people, and the adjacent Serra do Mar State Park. What we were seeing was a work in progress, the gradual restoration from a monoculture to a forest which now contains 111 tree species growing among the remaining eucalyptus. It supports a wide range of other biodiversity including pumas and tapirs, a staggering 144 species of ants, 94 types of orchids and 238 species of birds. By gradually thinning out the eucalyptus trees, the company had maintained humidity levels and partial shade, which has supported the natural regeneration of many species. This is much more effective than clear-felling and large-scale replanting. The thick regeneration now means that felling and removing the remaining trees is a challenge on the steep ground, and so about half of the remaining eucalyptus trees are being killed where they stand. This has created a new habitat of large dead wood, attracting insects and birds, which also use the dead trees as perches. In turn, the birds are important for seed distribution, and so re-introducing even more native tree species. The success of the restoration is best seen in the quality of the water in the Rio Itanga, which runs through the park. When the forest was being commercially harvested, there was an extensive road network which meant that large quantities of silt were often washed into the river. As the restoration has progressed these roads have also been restored and re-routed. The river is much healthier and is now an important source of clean drinking water for Sao Paulo city.